Welcome readers. We are taking a bit of a different tack with these reviews. Typically, we look at tools to perform a specific task. Fear not, there will be lots of tools reviewed. What we are going to do is tackle one of the most aggravating things about cutting PVC pipe, how do you cut it, so the end is straight and square? We agree with you, that is annoying and should be so easy to do. By the end of this article, you’ll know how to cut your PVC perfectly. We will look at the saws that you can use to cut this pipe. To give you a little head’s up, you can cut this material with any saw you have on hand. Saying that there are saws better at cutting PVC than others. We’ll fill you in on those. There are also cutters for smaller diameter pipe. If you work a lot with small diameter PVC pipe, these might be a sensible purchase. If you only cut occasionally, these are a bit of a luxury tool. By the end, our goal is to have you champing at the bit to go and cut perfectly straight PVC pipe pieces. Shall we raise the curtain on this storehouse of knowledge? Let’s get the pipe cutters out of the way first. As we mentioned above, these are limited to cutting smaller diameter pipes. If they were to be used on larger diameters, there would be a risk of crushing the pipe rather than cutting. Right out of the chute, we need to give you one thing to look for, and that is the type of pipe the tool is designed to cut. Some cut only PEX. Some only cut PVC. Others are more versatile and cut whatever you feed it. That’s our kind of tool! Multiple uses from a single implement of DIY is the way we like to roll. The one we like is exactly like the handheld cutter used to cut copper pipes neat and clean. The tool has an expanding jaw that allows it to cut tubing from ¼-inch to 1-1/8 inch in diameter. This side houses the cutter. The other side has a pair of rollers. Insert your pipe, line the cutter up with your mark, tighten and start rotating the cutter. Hint: You might prefer to clamp the cutter in your vise and rotate the tubing. Instead of the compact model above, many people prefer the scissor/lopper style of cutting. Enter the ratcheting PVC pipe cutter. These tools work the same way ratcheting limb cutters do. There is a sharpened half-moon side where you place the pipe. The other side, or jaw if you prefer, has the primary cutting blade. The ratchet action kicks in as you squeeze the handles to cut. More pressure is applied as the cut progresses. Then, ta-dah, a nice, clean cut! 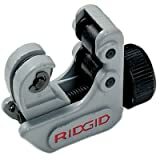 For this we recommend the RIDGID 23498 Model RC-1625 Ratcheting Plastic Pipe and Tubing Cutter. We start with the least expensive option for making straight cuts in PVC pipe every time, a simple miter box. Miter boxes once were a staple of many workshops before the advent of affordable miter and chop saws. If you have any of these, you are set. You can get by reading our blade recommendations. Using a miter box in simplicity in itself. Secure it to your bench or another sturdy work surface. The model we are about to recommend has a level base and a pair of mounting holes. Screw it down where you have room to move the pipe. Mark the spot to cut, push the pipe firmly against the back and make your cut. A nice, straight, and clean cut every time. Hint: If you do not want to mount the box permanently, you can use it by clamping it is a tool like the Rockwell Jawstand. Or, you can take it off and store it with the mounting screws. You can use any saw you have on hand with the miter box. It can be a hack saw, a crosscut saw, or a back saw. If you have those, you are good to go. The saw needs to have fine teeth (16 teeth per inch (TPI) or more) and any of those just mentioned meet the TPI criteria. Keep reading though, because some saws work better than others. We recommend a saw with a wide, stiff blade like the back saw. This saw is designed to work with miter boxes. It is very rigid which gives you greater control — flexible blades flex when in use. To achieve the perfectly straight cut nirvana, stay away from the flexible blades. For beautiful straight cuts, we recommend the Great Neck MM14 14 Inch Miter Back Saw. The manual miter box has been replaced in large part by affordable and feature rich miter and chop saws. Cutting PVC pipe with one of these babies is a matter of seconds. Mark the cut point, push the pipe firmly against the backstop, and cut away. If you have a general-purpose blade in your saw already, it will likely work, especially if it is carbide tipped. But not all blades will make the cleanest cut. You will need a higher TPI than needed for cutting framing lumber. Something along the lines of what you need for cutting molding. Referring to the note in the previous section, you may not want to use your finish blade cutting PVC. Therefore, you need one that can do the job with messing with your good blade. 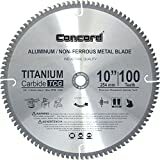 We recommend the Concord Blades ACB1000T100HP 10-Inch 100 Teeth TCT Non-Ferrous Metal Saw Blade. We can’t just ignore the hack saw even after years of miserable results using it to cut PVC pipe. Heck, most DIYers and contractors have one in their shops. So, the focus of this review is on technique. Let’s go step-by-step. Carefully measure and mark your cutting spot. Take a sheet of cardstock (the weight of index cards) or two sheets of printer paper and wrap them around the pipe. Be sure the edges of the paper overlap and are even all the way around. This means they are square. Tape securely so the paper doesn’t move and stays square. The edge of the paper should almost touch the mark but be the width of the blade away. Clamp the pipe securely and make sure it is level. Put a metal cutting blade in your hack saw and tighten as much as possible. Start your cut and work slowly, keeping the cut parallel to the paper. Good technique here helps. Stand parallel to the pipe and hold your “sawin’ arm” Straight out towards the cut mark. Saw while maintaining this position, your arm moving straight back and forth. Depending on the length of the unsupported pipe, you may want a helper to keep the piece from breaking off and leaving a jagged chunk or breaking a piece out of the side you want to use. The take away we hope you have gotten from these reviews is that simple tools and proper technique will produce the elusive straight cut you have been searching for these many years. Cutting PVC pipe doesn’t need to require expensive tools. What you have at hand may do the trick. Let’s wrap this up with a summation of what we recommend. If you have a miter or chop saw, outfit it with a blade you don’t mind using in plastic, the Concord Blades ACB1000T100HP Metal Saw Blade. If you cut pipe larger than 1-1/8” on occasion, buy the RIDGID 40617 Close Quarters Tubing Cutter. If you more frequently cut larger pipe, let’s say for your spud gun production line, buy the Great Neck Saw PMB12 12″ Plastic Miter Box and outfit it with the Great Neck MM14 14 Inch Miter Back Saw. That’s it for our reviews of the tools and techniques that will help you master the art of the straight PVC pipe cut. Happy sawing!